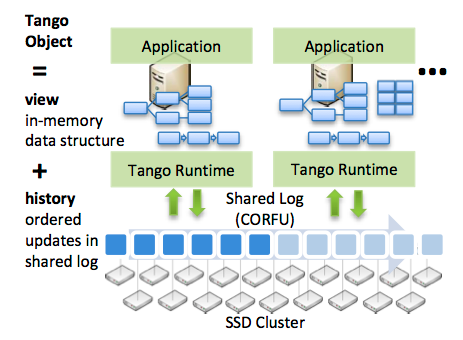 Paper summary: Can a decentralized metadata service layer benefit parallel filesystems? Parallel filesystems do a good job of providing parallel and scalable access to the data transfer, but, due to consistency concerns, the metadata accesses are still directed to one metadata server (MDS) which becomes a bottleneck. This is a problem for scalability because studies show that over 75% of all filesystem calls require access to file metadata. If you recall, ZooKeeper uses a filesystem API to enable clients to build higher-level coordination primitives (group membership, locking, barrier sync). This paper is interesting because it takes ZooKeeper and uses it directly as a metadata server for a filesystem leveraging the filesystem API ZooKeeper exposes in a literal manner. FUSE is used to act as a glue between the ZooKeeper as MDS and the underlying physical storage filesystem. A DUFS client instance does not interact directly with other DUFS clients; Any necessary interaction is made through ZooKeeper service. The figure shows the basic steps required to perform an open() operation on a file using DUFS. A. The open() call is intercepted by FUSE which gives the virtual path of the file to DUFS. B. DUFS queries ZooKeeper to get the Znode based on the filename and to retrieve the file id (FID). C. DUFS uses the deterministic mapping function to find the physical path associated to the FID. 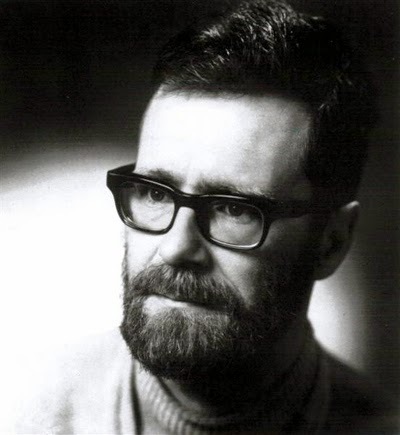 D. Finally, DUFS opens the file based on its physical path. The result is returned to the application via FUSE. Alternatively, directory operations take place only at the metadata level, so only ZooKeeper is involved and not the back-end storage. For example, the directory stat() operation is satisfied at the Zookeeper itself (the back-end storage is not contacted) since we maintain the entire directory hierarchy in Zookeeper. These tests were performed on a Linux cluster. Each node has a dual Intel Xeon E5335 CPU (8 cores in total) and 6GB memory. A SATA 250GB hard drive is used as the storage device on each node. The nodes are connected with 1GigE. I am bugged by some of the limitations of the evaluation. In these tests the ZooKeeper servers are colocated (running on the same node) as the DUFS client. This naturally achieves wonders for read request latencies! But this is not a very reasonable set up. Moreover, the clients are not under the control of DUFS, so it is not a good idea to deploy your ZooKeeper servers on clients which are uncontrolled and can disconnect any time. Finally, this disallows clients from faraway. Of course ZooKeeper does not scale to WAN environment, and all the tests are done in a controlled cluster environment. This paper investigates an interesting idea, that of using ZooKeeper as MDS of parallel filesystems to provide some scalability to the MDS. Thanks to the advantages of ZooKeeper, this allows improved read access because those can be served consistently from any ZooKeeper server. And, due to limitations of the ZooKeeper, this fails to address the scalability of update requests (throughput of update operations actually decrease as the number of ZooKeeper replicase increase) and also lacks the scalability needed for WAN deployments. Another limitation of this approach is that the metadata need to be able to fit into a single ZooKeeper server (and of course also the ZooKeeper replicas), so there is a scalability problem with respect to the filesystem size as well. We are working on a scalable WAN version of ZooKeeper, and we will use the parallel filesystems as our application to showcase a WAN filesystem leveraging our prototype coordination system. My research group and Tevfik's research group meet jointly for a weekly distributed systems. This gives our students a chance to give talks about current project and get feedback for improvement in a friendly setting. In this week's seminar, Luigi presented his research on building energy-efficient file systems. I was initially skeptical about energy-efficiency as a research topic. 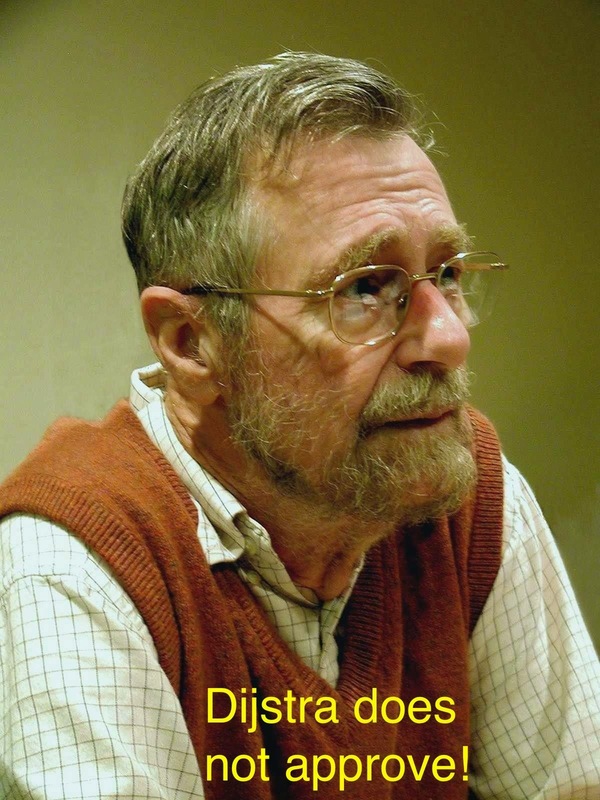 Academicians like to work on things that they can quantify and improve, so I was thinking that energy-efficiency in distributed storage was an opportunistic research problem, rather than a real-world problem. Turns out, I couldn't be any more wrong: IT companies spend $10 billions every year on energy consumption (This is 3% of entire expenditure of US!). $3.5 billion of that $10 billion is energy expenditure is due to the storage systems. Dynamic power management (DPM) is the primary mechanism for energy saving at the storage systems. DPM basically means turn the disk off if you're not using it. An idling disk spends energy because it is still rotating, and this mechanic motion which burns energy. But turning a disc off is not easy. It takes 10s of seconds to stop and start hard disk, and the energy usage spikes at these transition points. This makes the problem into an optimization problem. When is it beneficial to turn the disk off? How can you create gaps long enough to turn off the disk? The literature discusses the following DPM-enabling techniques for energy-saving in storage systems. Most of these techniques prescribe data access locality improvements. 1) Memory and disk caching: Caching is not only good for providing low-latency but also in some cases good for saving energy. If we can use cache to answer instead of turning on the disk, we can give the disk more time to sleep. But what should be the cache size? If it is too small, data won't fit, this won't provide much/any saving. If it is too large, the cache itself may consume more energy than it saves. 2) Diverting accesses: Data is stored redundantly, so this gives us the opportunity to spin down some redundant disks by diverting the accesses to the already active/hot ones. Unsurprisingly, there is a tradeoff of increased latency in doing so. 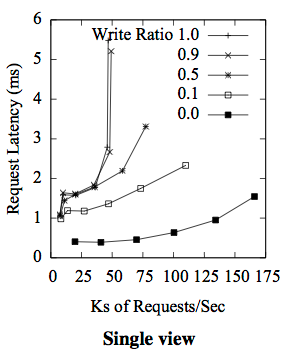 By limiting concurrency/parallelism you increase latency of replies. 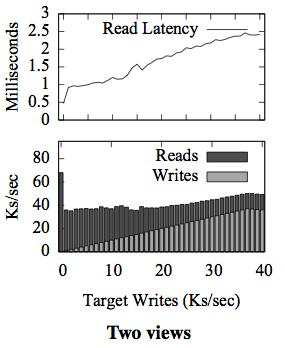 (Is energy-efficiency versus latency a fundamental tradeoff in distributed storage?) Maybe, by offering well-drafted SLA agreements to the clients, it is possible to give incentive to the client for trading energy efficiency for slightly increased latency. 3) Popular data clustering: This technique prescribes organizing the disk storage based on the previously observed access locality of data. So if a disk is hot, it is likely to stay hot, and if a disk gets cold, it is likely to stay cold and it can sleep. I guess there also could be orthogonal techniques if you don't need to serve requests in real-time. For those cases you have the opportunity to batch-schedule accesses. Luigi is working on a hybrid of these techniques to provide as much energy-efficiency as possible. 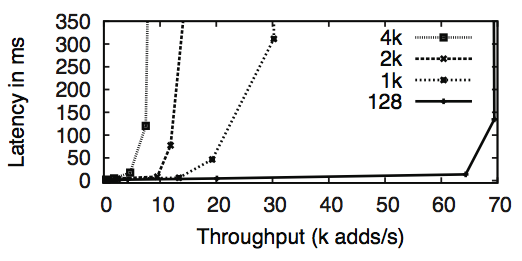 I wouldn't have thought energy-efficiency for distributed storage could be this interesting. There might even be a couple distributed algorithms problem here that I would enjoy. Zookeeper is an Apache project for providing coordination services to distributed systems. ZooKeeper aims to provide a simple kernel (a filesystem API!) for empowering the clients to build more complex coordination primitives. In this post I will provide a summary of the ZooKeeper paper, and talk about some future directions I can see this going. "Client" denotes a user of the ZooKeeper service, "server" denotes a process providing the ZooKeeper service, and "znode" denotes an in-memory data node (similar to the filesystem inode) in the ZooKeeper. 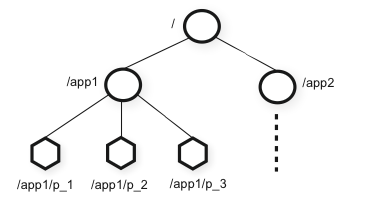 znodes are organized in a hierarchical namespace referred to as the data tree. There are 2 types of znodes. 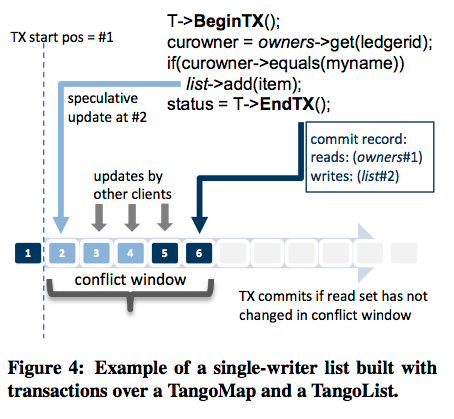 "Regular": Clients manipulate regular znodes by creating and deleting them explicitly. "Ephemeral": Clients create ephemeral znodes, and they either delete them explicitly, or let the system delete them automatically when the client's session termination. Additionally, when creating a new znode, a client can set a "Sequential" flag. Nodes created with the sequential flag set have the value of a monotonically increasing counter appended to its name. If n is the new znode and p is the parent znode, then the sequence value of n is never smaller than the value in the name of any other sequential znode ever created under p.
ZooKeeper also implements "watches" on znodes to allow clients to receive timely notifications of changes without requiring polling. All methods in the API have both a synchronous and an asynchronous version. A client uses the synchronous API when it needs to execute a single ZooKeeper operation and it has no concurrent tasks to execute, so it makes the necessary ZooKeeper call and blocks. The asynchronous API enables a client to have both multiple outstanding ZooKeeper operations and other tasks executed in parallel. ZooKeeper guarantees that the corresponding callbacks for each operation are invoked in order. Configuration Management: The configuration is stored in a znode, zc. Processes start up with the full pathname of zc. Starting processes obtain their configuration by reading zc with the watch flag set to true. If the configuration in zc is ever updated, the processes are notified and read the new configuration, again setting the watch flag to true. Rendezvous: When the master starts it fills in zr with information about addresses and ports it is using. When workers start, they read zr with watch set to true. If zr has not been filled in yet, the worker waits to be notified when zr is updated. Group Membership: A znode, zg, is created to represent the group. When a process member of the group starts, it creates an ephemeral child znode under zg. If the process fails or ends, the znode that represents it under zg is automatically removed. Processes may put process information in the data of the child znode, e.g., addresses and ports used by the process. Processes may obtain group information by simply listing the children of zg. If a process wants to monitor changes in group membership, the process can set the watch flag to true and refresh the group information (always setting the watch flag to true) when change notifications are received. Simple locks: To acquire a lock, a client tries to create the designated znode with the EPHEMERAL flag. If the create succeeds, the client holds the lock. Otherwise, the client can read the znode with the watch flag set. A client releases the lock explicitly or it is removed by timeout if it dies. Other clients that are waiting for a lock try again to acquire a lock once they observe the znode being deleted. Simple Locks without Herd Effect: All the clients requesting the lock are lined up and each client obtains the lock in order of request arrival. Read/Write Locks: The lock procedure is changed slightly to include separate read lock and write lock procedures. You can build even more powerful coordination primitives using ZooKeeper, and a Python binding is also made available here. Zookeeper applications at Yahoo! : ZooKeeper is used for the Fetching Service (FS) to achieve recovering from failures of masters, guaranteeing availability despite failures, and decoupling the clients from the servers, and allowing them to direct their request to healthy servers by just reading their status from ZooKeeper. FS uses ZooKeeper mainly to manage configuration metadata. FS is read-heavy, 10:1 to 100:1. As another example, Yahoo! Message Broker (YMB), a distributed publish-subscribe system, uses ZooKeeper to manage the distribution of topics (configuration metadata), deal with failures of machines in the system (failure detection and group membership), and control system operation. Other practical uses of Zookeeper has been explained nicely here. The replicated database is an in-memory database containing the entire data tree. Each znode in the tree stores a maximum of 1MB of data by default. For recoverability, ZooKeeper efficiently logs updates to disk, and forces writes to be on the disk media before they are applied to the in-memory database. Every ZooKeeper server services clients. Clients connect to exactly one server to submit its requests. Read requests are serviced from the local replica of each server database. Requests that change the state of the service, write requests, are processed by an agreement protocol. As part of the agreement protocol write requests are forwarded to a single server, called the leader. The rest of the ZooKeeper servers, called followers, receive message proposals consisting of state changes from the leader and agree upon state changes. This is similar to how Paxos works. ZooKeeper's atomic broadcast protocol (Zab) uses by default simple majority quorums to decide on a proposal, so Zab and thus ZooKeeper can only work if a majority of servers are correct (i.e., with 2f + 1 server we can tolerate f failures). Zab guarantees that changes broadcast by a leader are delivered in the order they were sent and all changes from previous leaders are delivered to an established leader before it broadcasts its own changes. Linearizable writes: all requests that update the state of ZooKeeper are serializable and respect precedence. FIFO client order: all requests from a given client are executed in the order that they were sent by the client. 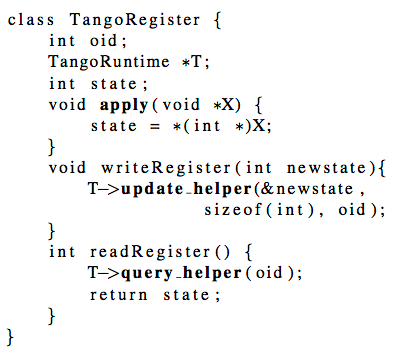 ZooKeeper provides FIFO client order property, but Paxos doesn't. Paxos may violate the FIFO client property as follows. Proposer P1 executes Phase 1 for sequence numbers 27 and 28. It proposes values A and B for sequence numbers 27 and 28, respectively, in Phase 2 with ballot number 1. Both proposals are accepted only by acceptor A1. Proposer P2 executes Phase 1 against acceptors A2 and A3, and end up proposing C in Phase 2 to sequence number 27 with ballot number 2. Finally, proposer P3, executes Phase 1 and 2, and is able to have a quorum of acceptors choosing C for sequence number 27, B for sequence number 28, and D for 29. ZooKeeper argues that such a run is not acceptable because the state change represented by B causally depends upon A, and not C. Consequently, B can only be chosen for sequence number i+1 if A has been chosen for sequence number i, and C cannot be chosen before B, since the state change that B represents cannot commute with C and can only be applied after A. When a server completes a write operation, it also sends out and clears notifications relative to any watch that corresponds to that update. Servers process the writes the leader server sends in order and do not process other writes or reads concurrently in order to ensure strict succession of notifications. Note that servers handle notifications locally. Only the server that a client is connected to tracks and triggers notifications for that client. 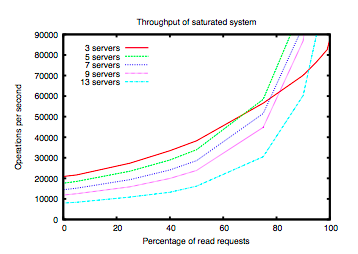 One drawback of using fast reads (local reads at one server) is not guaranteeing precedence order for read operations. That is, a read operation may return a stale value, even though a more recent update to the same znode has been committed. Not all applications require precedence order, but for applications that do require it, the sync primitive is used. To guarantee that a given read operation returns the latest updated value, a client calls sync before the read operation. Sync flushes the pipes so to speak. The FIFO order guarantee of client operations together with the global guarantee of sync enables the result of the read operation to reflect any changes that happened before the sync was issued. Read requests are handled locally at each server. 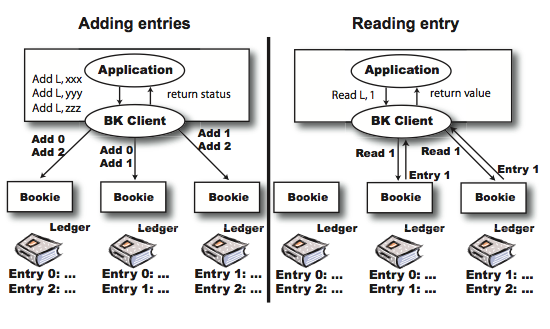 Each read request is tagged with a zxid that corresponds to the last transaction seen by the server. 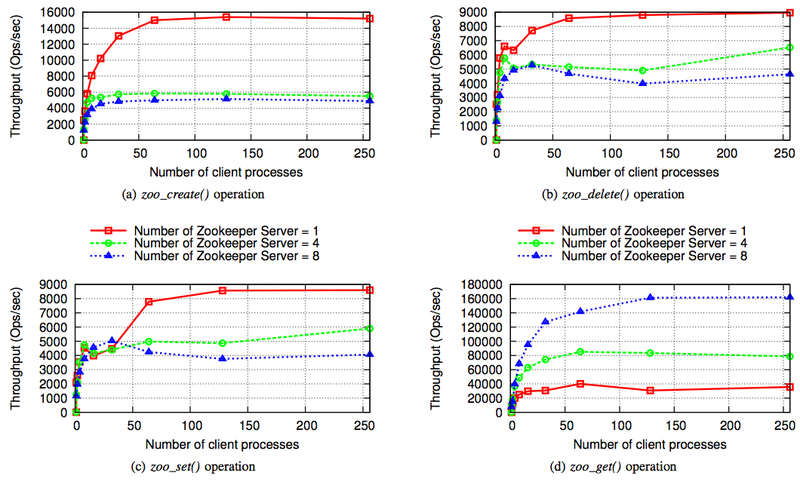 ZooKeeper servers process requests from clients in FIFO order; responses include the zxid that the response is relative to. Even heartbeat messages during intervals of no activity include the last zxid seen by the server that the client is connected to. This zxid defines the partial order of the read requests with respect to the write requests. If the client connects to a new server, that new server ensures that its view of the ZooKeeper data is at least as recent as the view of the client by checking the last zxid of the client against its last zxid. If the client has a more recent view than the server, the server does not reestablish the session with the client until the server has caught up. To detect client session failures, ZooKeeper uses time-outs. To prevent the session from timing out, the ZooKeeper client library sends a heartbeat after the session has been idle for s/3 ms and switch to a new server if it has not heard from a server for 2s/3 ms, where s is the session timeout in milliseconds. The evaluation is performed on a cluster of 50 servers. For the target workloads, 2:1 to 100:1 read to write ratio, it is shown that ZooKeeper can handle tens to hundreds of thousands of transactions per second. Each client has at least 100 requests outstanding. Each request consists of a read or write of 1K of data. 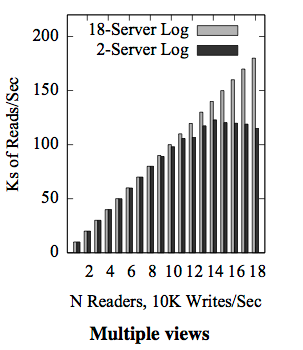 As you add ZooKeeper servers, the read throughput improves, bu the write throughput degrades. This is because atomic broadcast needs to be done via Zab. Also the servers need to ensure that transactions are logged to non-volatile store before sending acknowledgments back to the leader. ZooKeeper provides a minimalist and flexible coordination system and found a lot of use in production distributed systems. Zookeeper scales well with increase in read operations, but does not with increase in write operations. Zookeeper also does not scale with more Zookeeper replicas added. To alleviate this observer replicas are used, but they are limited in operation, and do not allow/benefit write operations. Finally, due to very large latencies involved ZooKeeper cannot handle across the WAN deployment of ZooKeeper servers. In most places ZooKeeper is punting the ball to the clients. Yes, this is due to minimalistic design and such, but this burdens the clients to solve the transactional update themselves, and we know that this is error-prone. Maybe this is really the way to go. Or maybe this is the soft-belly of ZooKeeper and a big opportunity to provide a new coordination tool. ZooKeeper is a great start, but we are just at the beginning. How does ZooKeeper implement/provide ephemeral nodes? 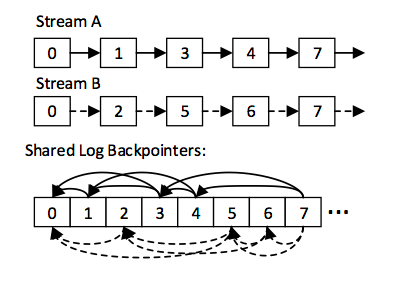 How can you implement distributed counters without using sequential flag? How can you implement general purpose transactions on ZooKeeper? Is ZooKeeper enough to implement general transactions? What is missing? Why not use ZooKeeper for serializing and reliably storing all data? Why is it a bad idea to use ZooKeeper for maintaining application logs?